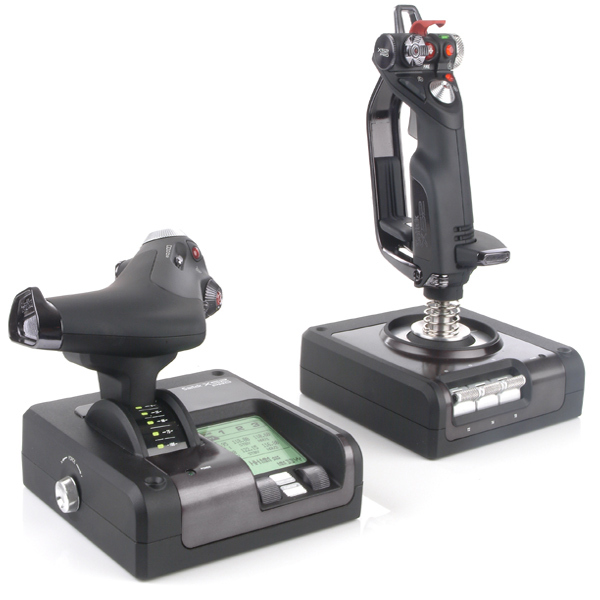 The last Saitek HOTAS (Hands On Throttle And Stick) I remember using first-hand was an older X-45 series, and I owned the original X-36F/X-35T combo before that. 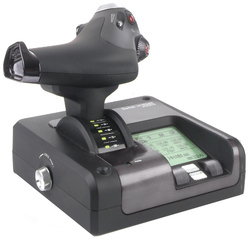 Saitek was one of the first companies to put out a full HOTAS solution for under $100 for the PC in the mid 90s. Other companies sold the stick and throttle units seperately up until that point. The X-52 Pro is a step up from the X-52 (non-pro version), and is light years ahead of all previous X-series HOTAS combos. Right away the first thing I noticed is how much sturdier feeling the stick is. I flew with a Thrustmaster HOTAS Cougar for about 6 years on one of my PCs, before the gimbal broke, so I'm definitely used to the sturdiest stick design ever too. The X-52 Pro isn't no where near as stiff feeling as the Cougar, but it's definitely better than any previous Saitek HOTAS sets I've ever used. The X-52 Pro utilizes a dual-spring design to accomplish this. On the throttle unit there's also a dial on the left-hand side to adjust the throttle tension. I can't say it makes a huge difference, but it's a noticeable improvement as you adjust for more, or less tension. The movement is on an arc, and overall the tension by default isn't bad to begin with. There's a nice mouse-stick control where the thumb wraps around the throttle. You can use this mouse-stick to emulate the mouse movement, and mouse buttons to click about virtual cockpits that are click-able, or to program the functions as any other keyboard commands. The regular X-52 (non Pro version) is silver with blue LEDs, looking more like something ripped out of a space ship, than something you'd find in a high-tech modern age military aircraft. The X-52 Pro is all black, and utilizes green LEDs by default. Overall this is a much better look. The stick and throttle still don't resemble a true F/A-18, F-16 or F-15 style stick and throttle, as many of the other manufacturers emulate visually with their products. Nonetheless the X-52 Pro is probably the best looking HOTAS they've made to date. I like it. You can even change the color of most of the LEDs from Green, to Amber or Red, and any combination of the three via a simple point and click menu under the Properties tab in Control Panel/Game Controllers. I thought that was a really nifty feature. My only concern is, how long will the LEDs last before they burn out? You can turn them off when you don't want to use them via the brightness slider to reduce wear and tear tho. Nevertheless there's no denying how amazing it looks all lit up, it just remains to be seen how long they'll last. The selector switch on the right-hand of the stick to swap between mode 1, 2, and 3 also changes color as you change modes. Mode 1 illuminates red, Mode 2, purple, and Mode 3 glows blue. On the throttle there are little LEDs that change from green to red as you hit military power, and afterburner. There are also the detents which you can feel, telling you by feel alone that you're at military power, and where the mark is to engage the afterburner. There's an off position at the beginning of the arc range too. The stick employs a twist-action handle to utilize rudder/yaw control. Some like sticks that twist, others can't stand it, so there's a tiny little tab at the bottom left-hand side of the handle, which you can pull out to disengage the twist-yaw control. I have no problem with it, but if given a choice I've always preferred pedals. On the front there's also a bolt you can unscrew, to adjust the stick height for smaller hands. By design this is also a right-handed stick, and a left-handed throttle. This is how it should be too. The military don't make left-handed cockpits, so why should joystick manufacturers? I'm left-handed, and over 30 years ago, going as far back as the Atari 2600 I learned to adjust, and to use a right-handed stick, or not play at all. I couldn't use a left-handed stick if my life depended on it now. I did miss something though on the X-52 Pro. I miss the rocker switch, which is what they used to have integrated into the throttle on the earlier Saitek HOTAS products. With the old spring-loaded rocker, you could control the rudder/yaw control on the throttle with two fingers, since earlier versions like the X-36 and X-45 didn't have a stick that twisted. Personally, I always felt that the rocker-switch was more intuitive. Over the years I've grown used to twisting the stick for yaw, so I feel, that a twisting stick is better than no rudder/yaw control at all. Nothing fully replaces pedals tho. It's just too bad they took away the rocker-switch feature with the X-52/X-52 Pro series altogether. The trigger is a dual-stage metal trigger, therefore it's two buttons in one. A signature feature is the little spring-loaded flap adorned with the wording “Safe”, that flips up covering the 2nd button, which has a cross-hair printed upon it. This is used for launching missiles, firing rockets, or dropping bombs. 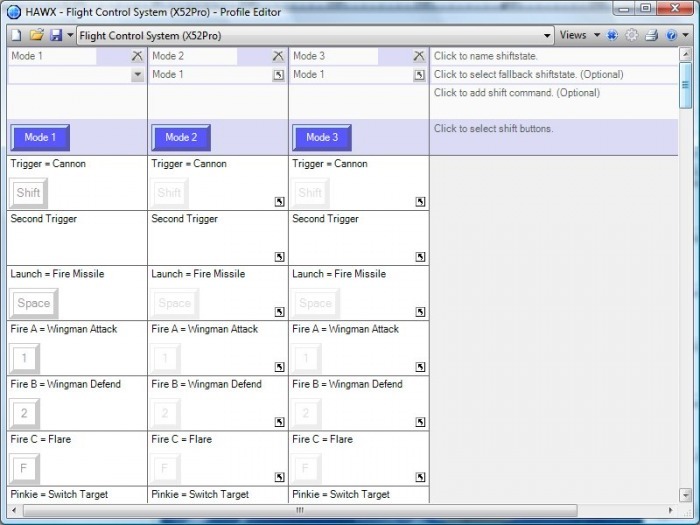 There are 4 buttons on the head of the stick, two 8-way hat switches, in addition to the “missile launch” button and dual stage trigger, and on the base are three 2-way toggle switches for six additional commands. Oh I almost forgot the “pinky” switch, which is also all metal, and is used to double the number of programmed commands. The throttle offers a single 8-way hat switch, two fire buttons, two rotary dials, the mouse-stick, scroll wheel/button, mouse-click button, a slider control, and a “clutch” button, to allow you to swap between profiles on the fly. To really plant it into place firmly, the X-52 Pro comes with suction cups, which you can use if needed, but they're pretty much optional. I had no problems keeping the HOTAS in place via the little rubber feet that it comes with right out of the box. The Multi-Function Display (MFD) is different than the one integrated into the regular X-52 as well. This MFD can display radio information from Microsoft's Flight Simulator X, and they include a demo version to show it off. Personally, I like that the MFD displays the time and date as well, and it can display three different time zones, in regular 12 hour clock format, or military time. You can decide which format time is displayed via the properties tab under Game Controllers in Control Panel too. There's also a brightness slider, to allow you to adjust the brightness of all of the LEDs. 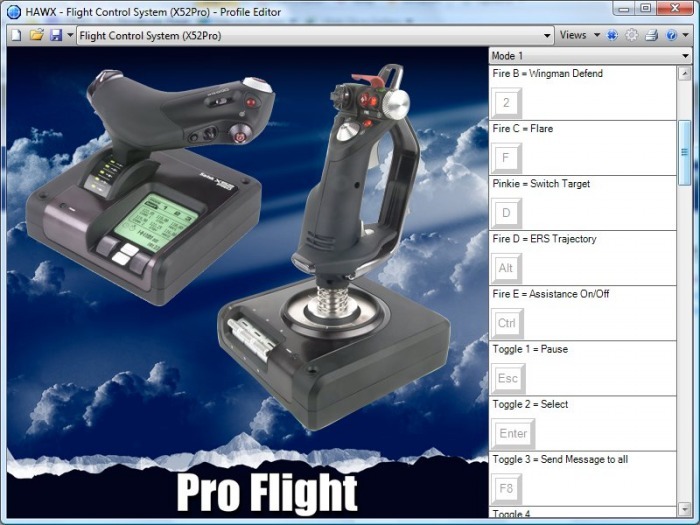 As you press any button on the X-52 Pro stick, or throttle, the MFD will display which button was pressed, and it also displays the current Mode which the HOTAS is in, 1, 2, or 3. Metal wheels for Pg Up and Pg Down and MFD Select are also on the throttle to cycle thro MFD information. The Start/Stop and Reset buttons also cycle through all 3 of the time settings provided, and control the stop-watch. I'm yet to find a use for the stop-watch feature built into the MFD, but it's worth mentioning that it exists. I guess I could use it when I'm cooking and flying, so I don't forget to flip my steak, or burger in time? Completely by accident, I also learned that the MFD also displays the name, album and artist of songs being played through Windows Media Player. The dial on the right also controls the volume, and when pressed down pauses Media Player. The MFD concept is quite brilliant, the only downside is, that only MS Flight Simulator supports the MFD to do more than display date/time, to be a fancy Media Player display, and functions of the HOTAS as buttons are pressed. It's more of a feature for the future, and they do provide an SDK (Software Developers Kit) to allow end users to program their titles to take advantage of the MFD, but the fact remains the flight-sim market isn't exactly booming like it once was in the 90s. Therefore the future isn't exactly bright for the MFD to be fully taken advantage of. The X-52 Pro was released initially in 2007, and it's now 2010 and there are still no major titles taking advantage of the MFD capabilities right out of the box. The X-52 Pro comes with Saitek's SST programming software, and with this software you can program pretty much every feature on the stick to emulate simple, and even quite complex keyboard commands, and strings of commands called macros. They've always made a good software solutions as far back as I can remember. This newest version of SST is fairly easy to use as well. The version of Windows that you're running will dictate how smooth the installation goes. I learned the hard way not to use the CD drivers and SST software if you're running Windows Vista 64-bit/Windows 7 64-bit. The X-52 Pro works just fine using the drivers from the CD as a direct input device in Vista 64-bit, and I had no issues using it that way, it's using SST that was problematic. You definitely need to download the 64-bit drivers from Saitek, and install the 64-bit drivers FIRST, then the 64-bit SST. That's the only way to get the X-52 Pro working with the SST software, and with the proper Properties tabs and functions under Vista 64-bit. The Quick Start guide is truly laughable too. It's a tiny pamphlet in literally 8 different languages, and all it says is plug the device into the USB slot, and IF your product came with a CD, now is the time to insert it. There's more in-depth documentation on the CD itself. Thankfully the process of installing the X-52 Pro isn't complicated, aside from the SST software issue I encountered on Vista 64-bit. Most users should be able to plug it in, and install drivers and SST from the CD, and be good to go on a 32-bit OS. As far as programming the HOTAS... These days I really don't see the need to go that deep to program everything by hand, since every game out there today lets you remap the commands via the game itself and Direct Input. I do remember those days of opening a text editor to create profiles for my old Thrustmaster gear in MS-DOS. It was arcane, and had it's own little language to master. Today it's all done via an image of the stick and throttle, via a really nice interface. One thing though that they did back in the old days, that Saitek doesn't do now is include pre-made profiles with the software installation. Even in the dark ages of MS-DOS both CH and Thrustmaster included a bunch of pre-made profiles for at least a dozen or more popular games and simulations. Considering now most older flight-sims don't work under Windows Vista/Windows 7, it wouldn't have been hard to have included some basic profiles for the small number of titles that do run still like IL2 Sturmovik, Wings of Prey, Lock On Modern Air Combat, Flight Simulator X, X-Plane 9, etc. In their defense, they do offer a dozen or less profiles that you can download from their website, but being included with the software install would have been a nice touch. Even a dozen profiles would have been better than none. Technically, with the 3 mode switch, plus the pinky button (which also doubles every function while held in), you can pretty much program up 6 different functions per button/function. I personally see that as overkill, because even when I was deep into simulations like the ultra-hard-core realism of Falcon 4.0 in the late 90s, I still never utilized that many buttons. 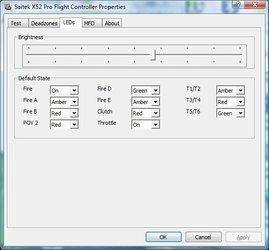 Therefore the possibilities are endless, and if you need more buttons to program than what is offered by the X-52 Pro, then you need to find a life. Like I said before, I don't find much use for the programming software these days, since every game imaginable offers Direct Input key-mapping and axis mapping functions. 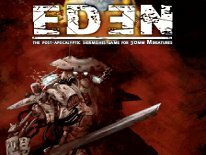 The only time you need to utilize the programming features, is when you really want to get deep, and when a game or simulation is just being difficult. A simple macro for raising the gear, and adjusting flaps is as deep as I'd go with the programming side of things these days. Even then, with this many buttons I can reach over and flip the switch to raise the gear, and use the slider on the throttle to adjust my flaps, and program those to do that via the game itself. Therefore the option is there to go as deep as you want with programming the X-52 Pro, but most won't need to. Thus far I've used the X-52 Pro with Lock On Modern Air Combat (LOMAC), IL2 Sturmovik, Wings of Prey, Jane's F/A-18, FSX Demo, Tom Clancy's HAWX, MekTek's Mechwarrior IV Mercenaries, ArmA II and Wings Over Europe: Cold War Gone Hot. Wings of Prey is the newest title, and was the only one to give me any problems with the X-52 Pro. However, it was clearly not the fault of Saitek or the X-52 Pro. It's evident, that while Wings of Prey is a fantastic WWII flight sim, the joystick support is pretty shoddy. 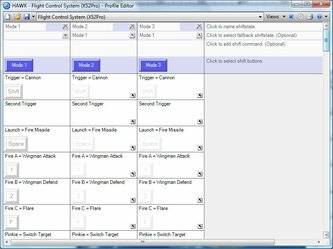 There are options for various sticks to choose from, even one for the X-52, but selecting the X-52 option in game also requires that you manually reset every axis within the game Options/Controllers menu. Additionally, Wings of Prey seams to enable trim settings when you opt to use most popular stick/throttle/rudder combo devices, and in doing so, even after resetting the various axis's, now you must adjust the trim options, or end up with pretty much no control over the plane. To remedy this I just set up the rudder, aileron and elevator trim controls from within the game to utilize the slider and the two rotary dials on the X-52 Pro throttle, to give me quick access to the trim controls. Unfortunately it took a lot of trial and error for me to realize I had to adjust the trim settings. Most will think they're gear is messed up, but it's not. A trip to the tech support forums for Wings of Prey was the only way to realize that my X-52 Pro was just fine, it's their input device support that's lacking. Like I said Wings of Prey is great fun, but has to offer the absolute worst support for sticks out there, and you end up having to manually setup any device through the key-mapping within the Options/Controller menu. Aside from the Wings of Prey issue, I had no problems at all flying with the X-52 Pro. The X-52 Pro works great controlling 100-ton battlemechs in the free downloadable full version of Mechwarrior IV: Mercenaries from MekTek, and was precise enough to handle prop sims, and jet-age simulations just the same. Even though I miss having pedals, I was still able to strafe ground targets precisely with the twist-action rudder/yaw feature on the stick just fine. Even the lighter realism of Tom Clancy's HAWX was great fun with the X-52 Pro, and it just felt more like flying, as it should. I have reviewed sticks, throttles and HOTAS hardware in general since the early 90s for the PC. There isn't many controller products out there, which I haven't used first-hand. That aside, my experience goes as far back as the MS-DOS days, and we've come a long way since then. One thing that has stayed the same, is that we still demand a high quality stick and throttle that will last first and foremost. 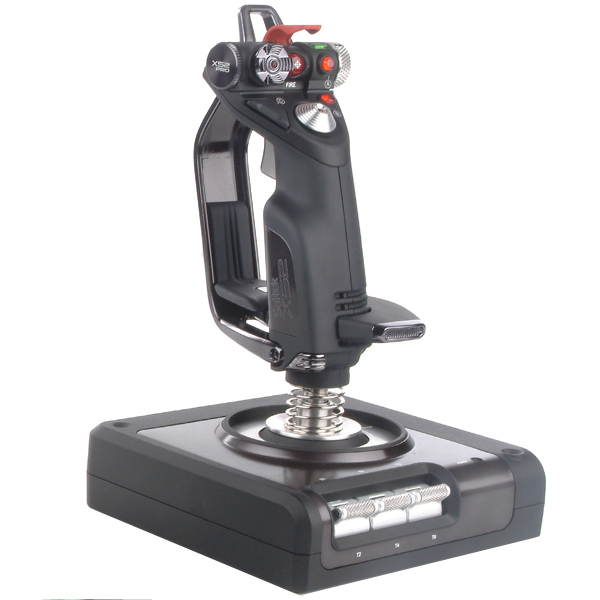 I've covered every Saitek stick since they released the first X-36 HOTAS, and the very first ever Cyborg products. From what I've seen first-hand, the X-52 Pro is definitely one of the best HOTAS solutions that they've come up with to date. The X-52 Pro doesn't reinvent the HOTAS, but it improves upon all previous attempts, and includes all of the features and functionality one would expect to find in a stick and throttle combo today just the same. The jury is still out on the MFD, because while it's a novel feature, there's no one beating down the door to utilize it as intended. At present I'm only aware of the Flight Simulator X support, a mod for X-Plane 9 that's out there, and another little utility made by some guy to use the MFD to display data from Falcon 4.0 Allied Force. Personally, I'm happy with using it as a digital clock displaying the date and time, and for Media Player volume. It would be nice if other titles took advantage of it, but if no others ever did, I could live with that too. I'm getting older now, and it's nice to look over to my left and clearly see what time it is, versus trying to decipher the tiny Windows clock at the bottom of my monitor. At least the features being utilized by the MFD are useful ones, and I can't knock it for that. I really can't find anything bad to say about the X-52 Pro, other than, that Quick Start guide is useless, and they do need to include a note in the box to just download the 64-bit drivers and 64-bit SST software if you're running Vista 64-bit or Windows 7 64-bit, and not to use the drivers on the disk if you want it all to work as intended. Or simply include a new CD with the 64-bit drivers on it. It was frustrating to say the least, to find this out all on my own. Aside from my issue, installation is quite simple, and it doesn't take a lot of technical savy to pull it off. In use the X-52 Pro performed like a champ. It stayed calibrated without issue as well, and I never had a problem with it falling out of calibration. By design it's also quite ergonomic, and during long flights it was comfortable in-hand. 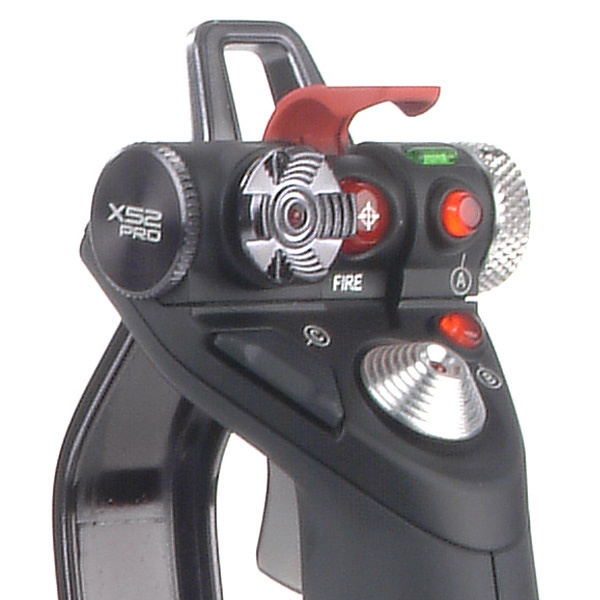 Price-wise the X-52 Pro will set you back about $130-$170.00 USD, depending on where you shop. I found it as low as $129.94 from Ritz Camera online, and as high as $169.00 direct from Saitek's own online shop. As well built and solid as this gear feels, that's a reasonable asking price. This is still mostly hard plastic, with some metal parts, but that's an improvement over the previous HOTAS setups from Saitek, thus asking $50 more for the X-52 Pro, over the non Pro version of the X52 is definitely fair. 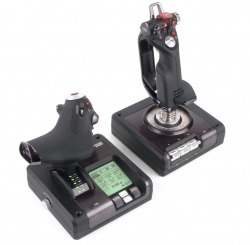 I'd call the X-52 Pro the best option in HOTAS gear available today for under $170.